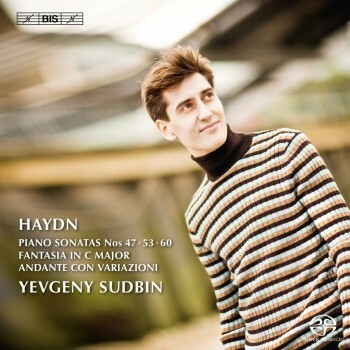 The release in 2005 of Yevgeny Sudbin’s first disc, a selection of Scarlatti sonatas, caused a sensation. A number of reviewers compared it favourably to the legendary recordings by Horowitz in the same repertoire, and on theBBC Radio 3 CD Review, the result was described as follows: ‘It's as if he's dragged Scarlatti off a dusty museum shelf and brought him out into the sunshine where both he and the music are happily basking.’ Sudbin’s following discs focussed on Russian composers from later periods – Rachmaninov, Medtner, Tchaikovsky and Scriabin – and received similar acclaim in the international music press. He now returns to the 18th century of Scarlatti, however, and to a composer who holds a similar place in his affections, namely Joseph Haydn. As Sudbin writes in his own liner notes, one of the qualities in this composer which he finds particularly endearing is Haydn’s ‘delight in silliness, outrageous wit and the breaking of all conventions’. The works chosen for this recital are by no means mere light-weight ‘musical jokes’, however; for instance they include the profoundly beautifulAndante con variazioni in F minor, which some have suggested was written in response to the death of Mozart. And as Sudbin himself acknowledges, musical jokes are easier to tell than to play; to use stand-up comedy tricks during a ‘serious’ recital risks turning it ‘into a sit-down tragedy’. Any joking is therefore strictly within the musical parameters – but that being said, Sudbin does enjoy himself in Haydn, and encourages his audiences to do likewise: ‘The odd carefully timed pianissimo chuckle is definitely among the less irritating noises you get in a concert hall’. In an affectionate tribute to the composer, Sudbin ends his recital with Larking with Haydn, his own tongue-in-cheek arrangement of the Finale of theLark Quartet.